Because writing, unlike other subjects, offers no single correct answer. In some ways, writing is like playing a sport. You have to put a variety of skills together to hit the target. As teachers, we demonstrate the rules of the game and guide our students in strengthening their performance. Like the coach who offers personalized advice to help each athlete improve, we give individualized feedback that accelerates learning. My Class Gets Too Loud & I Lose Time Refocusing Them! Naturally, the problem doesn’t lie with English teachers. This simply describes the mistake teachers make when they use conferences to try to correct every error on a child’s paper. Redlining papers like a high school English teacher does not serve young writers. Why? Nobody learns to play tennis like Serena Williams all at once. By the same token, children have a hard time staying motivated for the long haul if they’re faced with a long list of mistakes every time the teacher gives them feedback. In conferences, stick to one or two teaching points. That’s all. Anything more, students will not absorb. Give them one or two meaningful skills to improve, and they’ll be far more likely to carry these forward into their next writing project. Tip: Your teaching points address writing weaknesses, but be sure to honor strengths, too. Just as none of us likes to hear a solid stream of criticism from colleagues or family members, students need their efforts acknowledged. When conferencing, compliment at least one specific strength for your two teaching points. WriteSteps students learn to analyze anonymous student writing samples this way, too — by looking for glows (what has the writer done really well?) and grows (what could the writer improve in this piece?). WriteSteps utilizes the Writer’s Workshop model, in which students and teachers conference regularly about work in progress. First, consider what kind of conferencing you’re doing. Roving Conferencing is informal and brief. After demonstrating a concept such as adjectives, you assign independent writing and circulate. This is a time for looking over shoulders, making sure each child is on-task, giving structure to those who needs help getting started, and ensuring that all students understand the new concept. Formal Conferencing takes a little longer and begins several weeks into the school year. Classroom management and expectations are already well-established (more on this below). Now you can conference formally with a few students individually while the rest of the class is writing independently. This is a time to individualize instruction. You have just presented a lesson, but that lesson may not be your teaching point. In the video below, you can see both kinds of conferences. Keeping good notes for each student conference will help you choose your teaching points wisely, as shown in the example below. 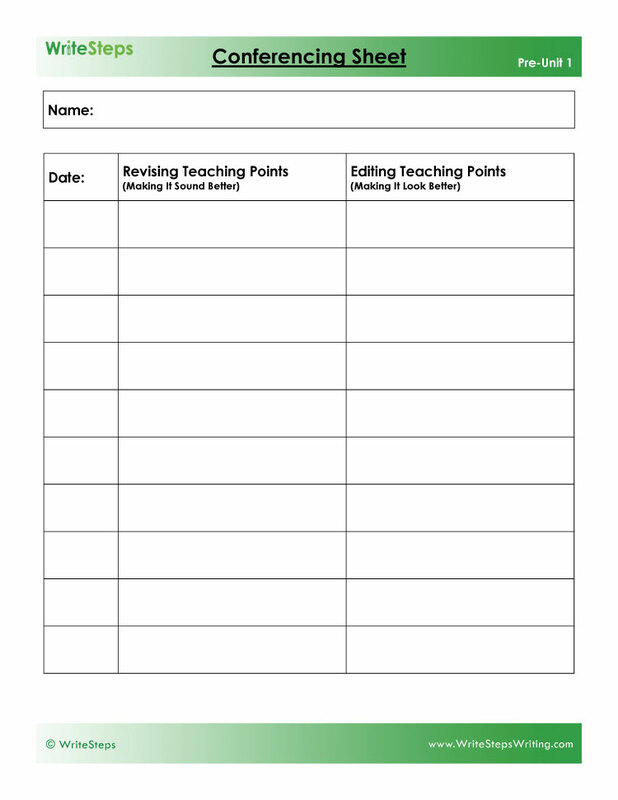 At WriteSteps, we provide a Conferencing Sheet you can staple to the inside back cover of each student’s writer’s notebook. This is a handy way to record the date and teaching points for each conference. Checking these dates regularly also helps you ensure that you’re conferencing with each student regularly. Example: Suppose I’m conferencing with Shawna, a first-grader, and I see that her writing is so crowded that it’s hard to decipher. A glance at her conferencing sheet reminds me that we’ve already conferenced about spacing twice. It s time to nudge her towards greater independence. I praise her ideas and remind her to put a finger space between each word, and conference with the next student while Shawna practices spacing on her own. Then I come back to Shawna and guide her in a new teaching point: making sure her piece has a clear beginning, middle, and end. It is more common to conference about spelling and conventions in kindergarten and first grade, since younger children have so much to learn just to get their spelling and writing readable. You will spend more time on higher level writing skills in grades 2-5. Tip: Keep a list of the focus skills you have taught the class, and check that list against your student’s paper to identify which ones need more practice. The ELA state standards for Writing and Conventions are identified in WriteSteps daily lesson plans as focus skills. If you are working with a child who has a good grasp on the grade-level focus skills, introduce something more sophisticated: figurative language, synonyms, or word choice, for example. Tip: Look at the student’s most recent 6 Traits scoring rubric to remind you of weaknesses in the last writing piece. Point out a weakness from that earlier assignment, and ask for evidence of that skill in the new piece — varied sentences, or strong verbs, for example. This can help you lead the student toward independence while still providing guidance. The early WriteSteps lessons are intentionally short to allow time for establishing expectations and classroom management techniques. If you’re dealing with interruptions, noise, etc. after beginning formal conferencing, re-visit the teacher’s Self Reflection Checklist in Unit 1. It provides 14 tips to help teachers prepare lessons, materials, and behavioral expectations. Make sure you have set up routines that fit your teaching style and personality, and be consistent. Tip: Be sure students know what to do when they finish writing. Some teachers allow students to get up and get a book; others do not want them walking around. Whatever you decide, be clear, and post your guidelines to reinforce your expectations. Tip: Be sure students know how to proceed when they don’t know how to spell a word. Practice stretching out words to hear the sounds, and reinforce using the word wall on the WriteSteps Privacy Folder. These habits will save you and your students much time! Once you’ve established them, your students will be comfortable not knowing how to spell everything right away. Spelling can be corrected in the editing stage. Tip: Don’t stretch your students’ capacities by overdoing it. Limit yourself to 3 students during a formal conferencing period (6 if you are teaching kindergarten). Know in advance who you will be meeting with that day, and post their names so students will be ready. Bottom Line: In conferences, teachers play the role of coach and cheerleader. Our playbook includes not only well-designed lessons that model essential writing skills, but also valuable resources such as the 6 Traits rubrics, lists of the standards taught to date (focus skills), record-keeping sheets, and posters that reinforce routines. These resources, and practice of the tips above, are the tools that empower students to play – and write – like stars.